Plot synopsis: A gang of thieves exploits a man's nondescript appearance by using him to rob a bank, certain that any witnesses will be unable to recall what he looks like afterwards. Review: There's a very odd conceit at the heart of this episode, which is that the main character has such an unremarkable face that no one can remember him, including his name, moments after meeting him. Indeed, people seem to forget who he is even as they are speaking to him! It's hard to know exactly what to make of this idea, as it is so clearly employed simply to make the story work that it is difficult to analyse in its own terms. No one, surely, is so unmemorable that people would fail to recognize him immediately after he has just robbed them; yet if the audience isn't willing to suspend disbelief and accept this, the plot would entirely fall apart. Regardless, the episode is quite fun, and Jack Benny is good value in the main role, even if the story is not terribly amusing, as it is obviously intended to be. The plot is also somewhat laboured, especially in the final act, which drags out the joke about how tedious and frustrating waiting in line can be (in a bank or anywhere else). Yet there is a fairly neat payoff at the end, and the whole is perfectly amiable and worth a listen. Plot synopsis: A dramatized version of the true life case of a woman, Lizzie Borden, accused - and acquitted - of killing her father and stepmother. Review: I'm prepared to listen to almost anything starring the superlative Agnes Moorehead, but this episode is not a great vehicle for her talents. It is based on a famous criminal case of the late nineteenth century, in which a woman was tried for the brutal axe murder of her father and stepmother (in Fall River, Massachusetts), but was found not guilty. The accused woman, Lizzie Borden, was even immortalized in a popular rhyme of the day, which is included in the episode (see my favourite line above), and the case has been the subject of numerous dramatic retellings (see my list below). The problem with this version is that it offers few insights into the crime itself and fails to offer any real conclusions of its own. There are hints that Borden may well have been guilty, despite her acquittal, but no concrete evidence is offered and other possible suspects - such as her older sister - are not considered. All in all, a pretty unsatisfactory dramatization, though it goes without saying that Moorehead gives a solid, committed performance in the main role. Plot synopsis: A young woman approaching her twenty-third birthday - when she stands to inherit a large fortune - fears that she will succumb to the family madness that sent her mother to an insane asylum at the same age, especially when she starts to see the figures in the picture hanging in her room appear to move. Review: If I gave half stars for reviews, I would give this episode three and a half. There's much about it that is intriguing and entertaining, yet at the same time, it lacks subtlety and believability. On the plus side, the story's Gothic melodrama, with its eerie and seemingly supernatural goings-on, manages to generate a nicely creepy atmosphere. Moreover, the heroine is a sympathetic character, tormented by night-time terrors caused by the strange painting in her room and left doubting her own sanity. However, the plot is just a little too ripe - if not downright silly - and when the truth is revealed at the end as to what is really going on it manages to be simultaneously predictable and unbelievable. Even so, it is still a fun journey getting to this point. Of the two versions of the story Suspense produced, the second is probably superior, not just because it stars the great Lana Turner (which is not to say that Nancy Coleman isn't good in the first) but because a few small changes to the script, such as giving some of the narrator's lines to the heroine, definitely improves it. On a final note, a really excellent Suspense episode that deals with similar themes of mental illness and female repression, with a plot that also centres on a protagonist who sees sinister, disturbing images on her bedroom wall(s), is The Yellow Wallpaper. Plot synopsis: A hired thug is paid by his boss to kidnap a man and take him to what he fears will be his death. 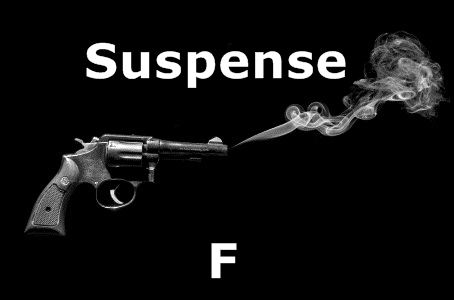 Review: Suspense aired so many episodes that it's easy to overlook some real gems, especially those that are not among its most famous productions (like The House in Cypress Canyon or Sorry, Wrong Number). This one is a case in point: I had not heard of it before listening to it for the purpose of writing this review, so I was very pleasantly surprised to discover what an excellent episode it is. The heart of the story is the journey of the two main characters, a not-too-bright killer and the man he has been sent to kill, and the desperate efforts of the latter to persuade the former to let him go. Consequently, I was reminded of the scene in Miller's Crossing in which Gabriel Byrne's character leads John Turturro's into the woods to kill him; or the episode of The Sopranos in which the character of Adriana is similarly taken to the woods to be murdered. In any case, it is the conversations between the two central characters that make this a superior episode, with some very good writing used to build tension and portray the increasing sense of despair of the man in fear for his life. There is also some striking symbolism in the form of the never-ending motion of the waves, which is referred to a number of times as the characters wait at the shore's edge of the beach at which they arrive, representing the remorseless inevitability of the story's events. Moreover, the episode is very cleverly structured, presenting first the perspective of the criminal, a man of limited intelligence but who nonetheless has his own (admittedly twisted) code of honour, and then that of his captive. Thus, we get to hear both sides' points of view. Without giving away too much of the plot - though I'll offer a SPOILER ALERT! here even so - matters unfold with a tragic logic as the paid thug doggedly sticks to the path his grim task has set him upon, deaf to any arguments to turn aside. All in all, a powerful, compelling drama. Plot synopsis: The police try to get a murderer to confess by playing on his superstitious nature. Review: There's not much to say about this episode - it's another not-very-good late-period Suspense story that confirms the fact that by the 1960s the series was, unfortunately, long past its prime. This is a weak crime story with a 'supernatural' twist that only barely holds the attention. Most listeners will probably guess where the plot is headed as soon as the brother of the murder victim appears, while the 'surprise' ending is also eminently predictable. Indeed, I found the last five minutes or so almost painful to listen to waiting for it to arrive. This episode is not terrible as such, just very ordinary and uninspired. Plot synopsis: A young man with pyromaniac tendencies hatches a plan to help a store owner in need of money collect on his fire insurance. Plot synopsis: A talent agent tries to uncover the secret behind a ventriloquist's refusal to accept an offer that might lead to his fame and fortune, and his reluctance to leave the carnival in which he works.